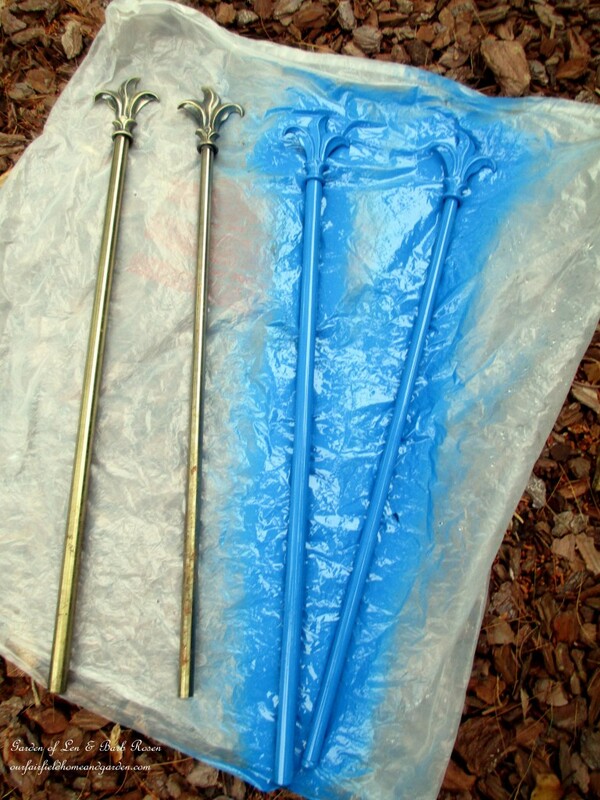 Home » DIY home and garden craft projects » DIY Project ~ Hose Guides from Curtain Rods! 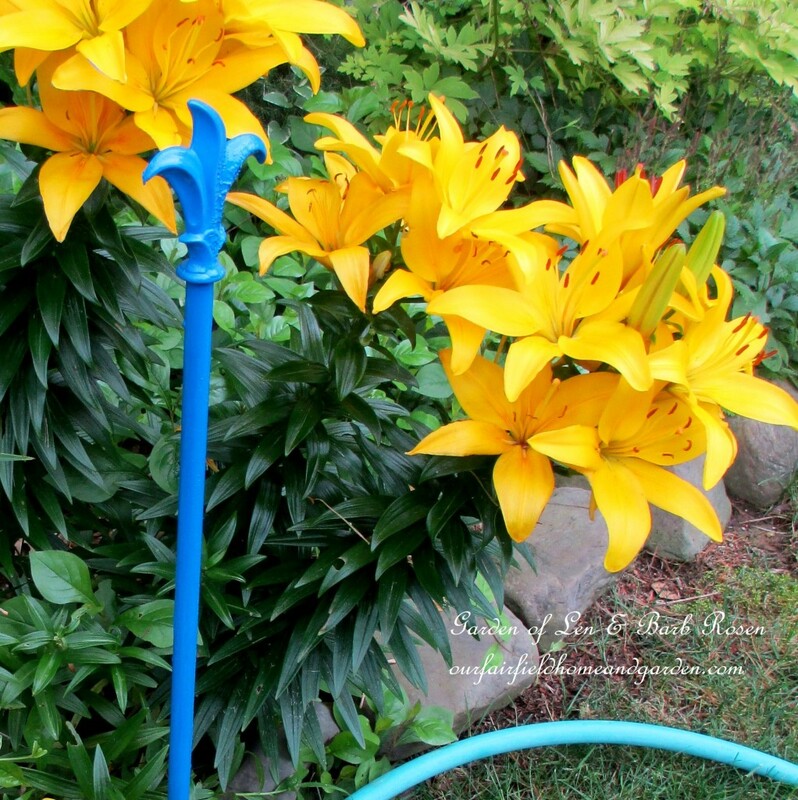 DIY Project ~ Hose Guides from Curtain Rods! 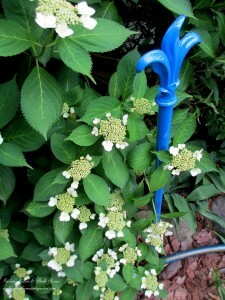 Have you seen the price of decorative hose guards lately? Well, I have and it made my blood pressure rise! Since early spring I have been on the hunt for pretty hose guards to prepare for the inevitable dry spells of summer. My flower beds curve around the yard and gazebo.So pulling the hose to water can damage plantings along the way. But no way can I spend ten or more dollars each on metal sticks to keep my hose in check, no matter how cute they are. So I came up with an idea. Two expandable metal curtain rods purchased at a yard sale for fifty cents with a pretty fleur de lis top got pulled apart. Now I had four sections that were my potential hose guards. Off to the hardware store to purchase short pieces of rebar at $1.60 each and off to the garden shed to pull out some leftover spray paint. I did take one of the rods with me to get the right diameter size of rebar. Note that there will be one rod slightly larger than the other. Take the smaller one with you so the curtain rods will fit over the rebar easily. 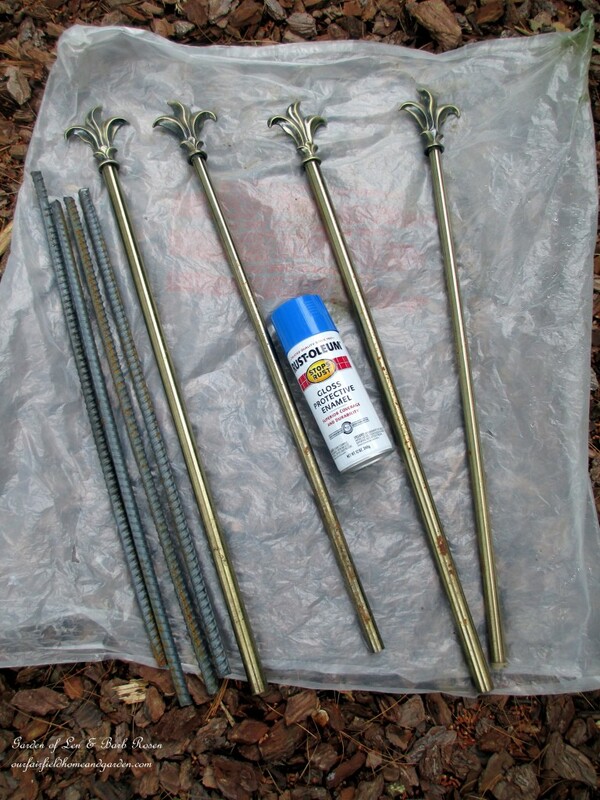 Paint the curtain rods and let them dry, pound the rebar in the ground with a hammer and slide the painted curtain rod over it. Now you have a hose guard that will swivel as the hose pulls across it and is a pretty garden accent, too! Less than $2.00 each and they work great! My hose guard searching days are over and I still have money to buy more plants! Make Hose Guides From Curtain Rods! Pretty, functional and thrifty! Love the pop of color in the garden! What a clever idea! So happy you liked my cheap alternative (but still pretty!) hose guards, Sharon! You are so clever! I love them! Thanks, Lyn – easy peasy to make too! This is one of those face palm posts, as I face palm and say why didn’t I think of this?! We all have myriad curtain rods with finials that would be well suited to this project. I am getting so many good reuse and repurpose ideas from the blogoshpere, thank you for sharing! I have those “Palm Moments” all the time! Glad I’m not the only one. Happy you liked the project. btw, love that you reused a plastic bag as a drop cloth. Those are nice, heavy duty and can be reused again and again for small projects! I totally agree with Mitzi! What I like about this is: it is functional, and decorative and so low in cost..cheap! One other thing I appreciate about this, is it can be hidden in amongst plants and no one know it is anything but decorative. Blessings. Thanks for writing and Happy Gardening! Absolutely, Nancy! Use up leftover paint instead of it sitting around in storage and never getting used! Be colorful! What a great solution to the hose problem. I have just removed curtain rods from my bedroom. Mine are wood but I am wondering if I used plastic dip if they would hold up? If not then metal rods are going on my thrift story look for list. Love the blue you picked for your rods. Thanks for sharing. Traci ~ The wood rods might not last as long, but still a great reuse. Or maybe you can dream up something even better for them!